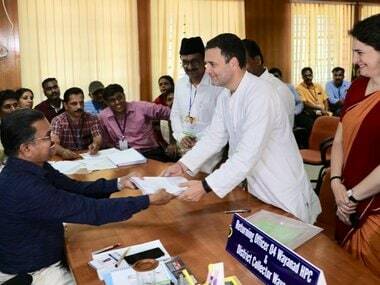 After filing his nomination papers in Kerala's Wayanad on Thursday, Congress chief Rahul Gandhi said he wanted to send a message that "India is one" and lashed out at Prime Minister Narendra Modi and the BJP for "attacking the idea of India"
"South India, Tamil Nadu, Kerala, and Karnataka have been feeling that the way Modi has been speaking and acting, there is an assault happening on their culture," Rahul said, adding that he will not say a word against the Communist Party of India (Marxist). "I understand that the CPM has to attack the Congress. I will happily absorb the attack, but won't say anything against them." 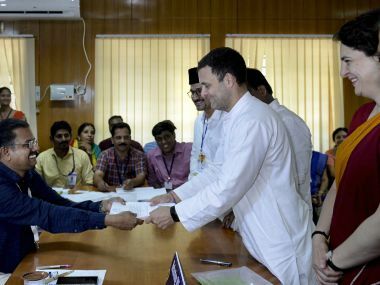 Rahul, accompanied by his sister Priyanka Gandhi Vadra and senior Congress leaders including KC Venugopal and Mukul Wasnik, submitted the nomination papers before the District Collector AR Ajayakumar at the district headquarters in Kalpetta. Tweeting shortly after Rahul filed his nomination papers, Priyanka said her brother was the "most courageous man" she knows. She asked Wayanad to "take care of him" because "he will not let them down." 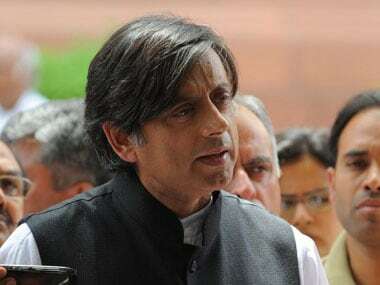 The 48-year-old Congress chief is contesting from Kerala in addition to his traditional stronghold Amethi, where he is pitted against the Union Textile Minister Smriti Irani. Rahul filed his nomination papers on the same day that Irani campaigned in Rahul's home constituency. Irani landed at the Chowdhury Charan Singh airport and visited the RSS office in Rajendra Nagar before proceeding to the Lok Sabha constituency. 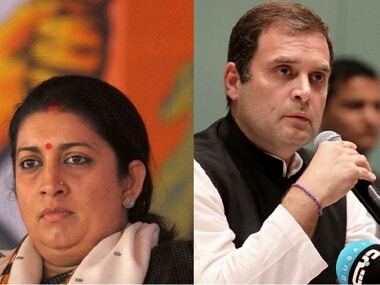 Addressing the BJP's Kisan Sammelan in Amethi's Salon, Irani called Rahul a "missing MP". "For 15 days you (Rahul) couldn't do anything in Amethi and now you've gone to Kerala," she said. She added that the Congress deliberately denied development to the constituency so that its farmers remain poor and subservient to generations of Congress leaders. Irani also alleged that Rahul has been asked by his party karyakartas to leave Amethi. Irani also called Rahul's decision to contest from the Wayanad Lok Sabha seat in Kerala an "insult" to the people of Amethi. Irani earlier tweeted that Rahul is off supporting 'anti-national forces'. This will be the second attempt by Irani to wrest Amethi from the Congress. In 2014, she lost the seat to Rahul by a margin of over one lakh votes. Rahul reached Wayanad on Thursday morning in a helicopter from Kozhikode, where he was staying at a guest house after arriving in Kerala on Wednesday. The Congress chief and his sister were greeted by a huge crowd. Before filing his nomination papers, Rahul — accompanied by Priyanka and other senior Congress leaders — participated in a roadshow across the Wayanad on an open bus. The roads from the Collectorate were filled with enthusiastic Congress supporters.